When Helen Macdonald lost her father unexpectedly, a man whom she loved and admired very much, she went a little crazy. She’d always been obsessed with falconry, and so she decided (rather spur-of-the-moment) to get a goshawk and train it. A lot of her inspiration came from T. H. White’s The Goshawk, a book that she read as a child — and hated because she felt that White didn’t know what he was doing. 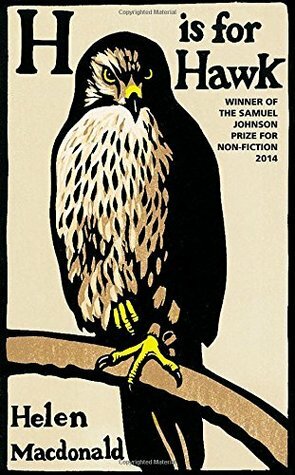 Most of H is for Hawk is about Macdonald’s training of the hawk and about her relationship with White’s books (not only The Goshawk but also The Once and Future King). Having never read The Goshawk and having read but hated The Once and Future King in high school (although I am willing to give it another shot now that I’m an adult! ), I felt a little lost with some of these references. But overall she does a good job summing the books up for the reader. Mostly it’s a story about grief. I cannot imagine losing my father and I can see how something like that happening could easily make you lose your mind. She’s obviously suffering from depression and anxiety, and probably a host of other issues. And this is her therapy. The reminded me a lot of Cheryl Strayed’s Wild, except that the writing was better and the author not quite so self-indulgent. If you’re interested in falconry, this won’t be the book to get you started, but I still found the descriptions intriguing.